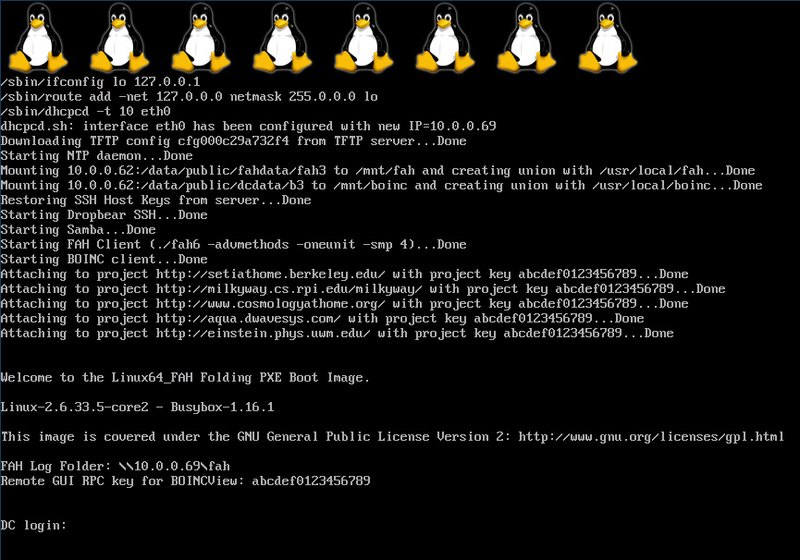 This project consists of a bootable PXE image supporting the BOINC and folding clients. The goal of this project is to be able to setup a centralized server that will contain a bootable image that systems on the network can boot via the network using PXE functionality. This opens up the possibility of running diskless distributed computing systems that can boot simply by enabling PXE functionality in BIOS once the server-side is setup. A centralized server setup will eliminate having to install and maintain multiple OS installs and makes kernel and file system upgrade rollout simple. The image uses a configuration file based on MAC address setup on the TFTP server and stores the distributed computing related data via a NFS share that overlays the read-only file system (aufs) that is loaded into memory via the network. The image also supports serial console and SSH for headless configuration. The image is console-only for a small footprint. The following file contains nvidia modules for all available kernels. Nvclock and nvidia-smi are also included. This file should be stored in the top-level directory along with initrd.img (typically /tftpboot/dc). It is downloaded and installed if CUDA=1 in the TFTP configuration for the host. The following file contains the Wine software used for running the Windows folding client in Linux. This file should be stored in the top-level directory along with initrd.img (typically /tftpboot/dc). It is downloaded and installed if WINE=1 in the TFTP configuration for the host. 08/13/11 - Built NVIDIA driver 280.13. Added support for adding rc and cron file to boinc or fah directory to allow for running extra commands on bootup and for overriding the default crontab. Updated lmsensors to the latest version. 04/23/11 - Built a 32-bit image based off the 64-bit image as recently requested. This image supports 32-bit FAH client 6.02 and BOINC 32-bit and includes optimized kernels for AMD Geode/K6/K7, Intel Atom, and Intel Pentium 3/4/M processors. This image can coexist on the same servers as the 64-bit image using the same PXELinux bootloader. Updated the 64-bit image to include the recent stable 270.41.06 driver release from NVIDIA which supports GPUs up to the most recent GTX 590. Fixed several bugs in fahcontrol and made a few updates to the init scripts. Also enabled RTC support in the kernels so that hwclock works properly. 04/16/11 - Added latest NVIDIA beta driver 270.26 and kernel 2.6.38 builds. Updated the folding related init and control scripts to the latest version similar or equal to what the other images use. 02/23/11 - Built NVIDIA Beta driver 270.18. This driver is needed to run the new Einstein@home CUDA app that does not require the usage of a full CPU per GPU work unit. Updated the download URL for the folding client to download the new version 1.34. Disabled bigadv via Wine with the release of the new Core A5 application that supports Linux64 bigadv. Added a nvidia version option to the TFTP configuration for simpler rollout of newer drivers. 02/01/11 - Updated the kernel to 2.6.37 with the latest image. The new Einstein@home Linux BRP3 CUDA app has been running stable on my test system for the past several weeks using the latest image and a GTX 295. 01/12/11 - Built several new kernels optimized for different architectures using experimental build of GCC 4.6. The new builds include support for AMD Barcelona, AMD Bobcat, Intel Atom, Intel Core 2, Intel Core i7, and Intel Core i7-AVX (Sandy Bridge). Upgraded the drivers to the latest 260.19.29 driver to support GTX 570 cards. 11/29/10 - Wine support has been added to the latest image making it possible to run the Windows folding client in Linux for folding bigadv support. Also, the latest image now supports running one or more folding uni-processor work units. Options for both clients are available via the TFTP configuration. If the bigadv option is disabled, the image uses the Linux folding client instead. 11/24/10 - The latest image now includes CUDA support for running Linux enabled CUDA projects like Einstein@home, Milkyway@home, and Seti@home. Tested successfully with Milkyway via a EVGA Dual-PCB GTX 295. I have included a sample DHCP configuration that is based on the one I use. This file is often located in the /etc directory. In this example, 192.168.0.0 is the network and 192.168.0.12 is the TFTP server. If you already have a DHCP server on your network, you may consider running this one as your primary DHCP server to avoid having two DHCP servers on the network. The hosts in the group will have access to the image. The 32-bit image can coexist on the same server as the 64-bit image. The init image for the 32-bit version is called initrd32.img and the 32-bit kernels are located separately from the 64-bit kernels in kernels/32. 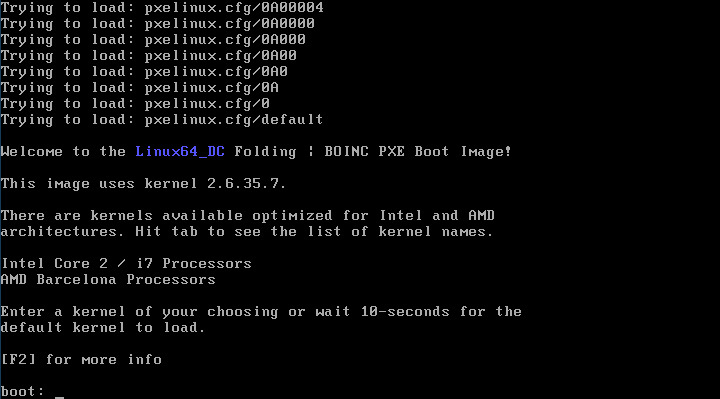 The PXE config file in pxelinux.cfg should reference the correct init image and kernel depending on whether the system is 32-bit or 64-bit. Separate PXE config files can be setup by MAC address to support 32-bit and 64-bit systems. The no_root_squash option may present a security issue as any files written to the NFS mount are written as if they were the root user. You can leave out this option but make sure that the directory has the appropriate permissions so that the client system can write to the directory. By default this would be uid:gid 65534. You may consider setting up IP restrictions using /etc/hosts.allow and /etc/hosts.deny for further security and a firewall script to only allow access to specific hosts. I would suggest using NFS instead of CIFS at this time. I ran into kernel crashes when using CIFS in conjunction with a Samba share and aufs or unionfs. The CIFS variables in the config can be left blank. The pxelinux bootloader configuration is kept in fah/pxelinux.cfg. In this directory you will find a default file. The default file will be used by the client systems unless a specific file is put in place based on MAC address. This file will let you set the default kernel that boots up. Also, you will want to update the TFTP server address (TFTPSERVER=) in the default file or other files which is needed by the client. The below file is an example of the bootloader configuration. If you enable SSH, the same credentials will work.